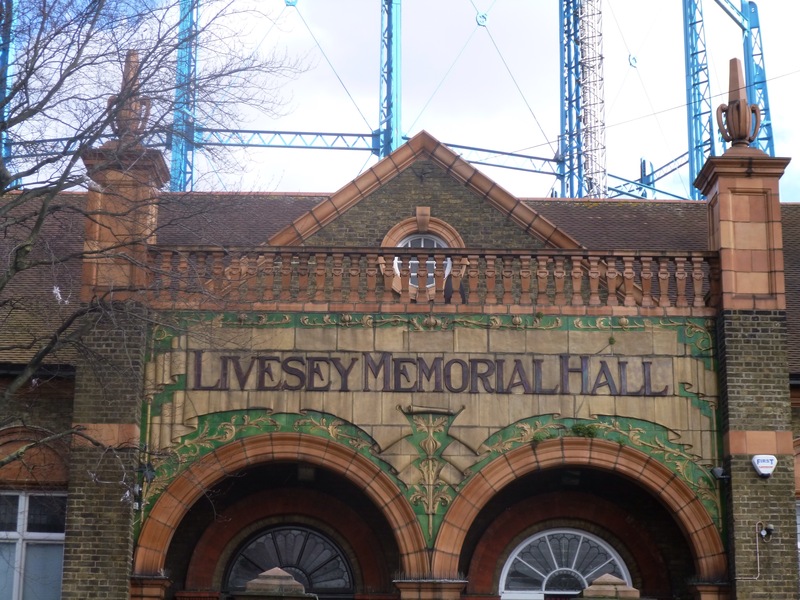 I have run past the Livesey Memorial Hall numerous times, almost always in the dark, without ever giving it a second glance – until one evening last week around dusk when the glazed panel on the porch was slightly illuminated by a stopped double-decker bus and I was rather impressed. 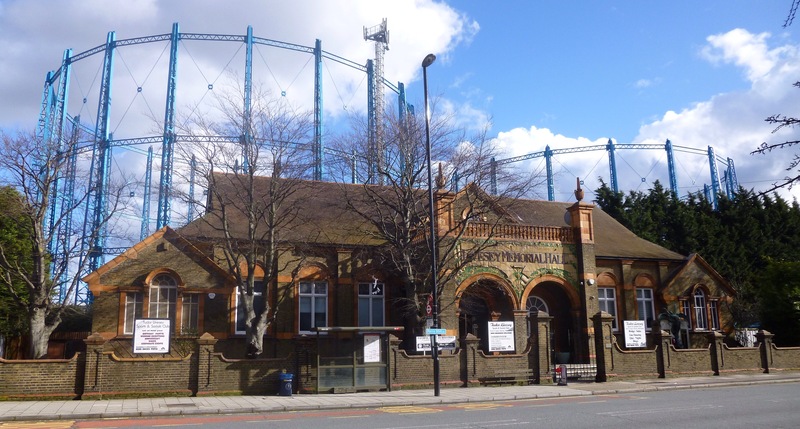 It was a recreation hall and club for the employees of the South Suburban Gas Company which lay behind – the works once employed around 2,000 but closed in 1969 with the arrival of North Sea gas, only the blue gas holders remain. The hall was named after a former company Chairman, George Livesey – who was also something of a philanthropist – his donations including money for the development of Telegraph Hill Park and he donated the building that until 2008 housed the now defunct Livesey Museum to, what was to eventually become, Southwark Council. From the outside at least, the large entrance porch with the glazed panel with LIVESEY MEMORIAL HALL emblazoned on it and terracotta balustraded balcony are its best features. The Hall is part of a trio of Grade II listings, the others being the boundary walls and a striking looking war memorial in front of the Hall, completed in 1920 and listing the with the listing employees of the South Suburban Gas Company who died in WW1, and later those who died in WW2, including the civilian deaths. In the centre is a bronze figure of Victory in the form of an angel triumphing over Evil, in the form of serpents. 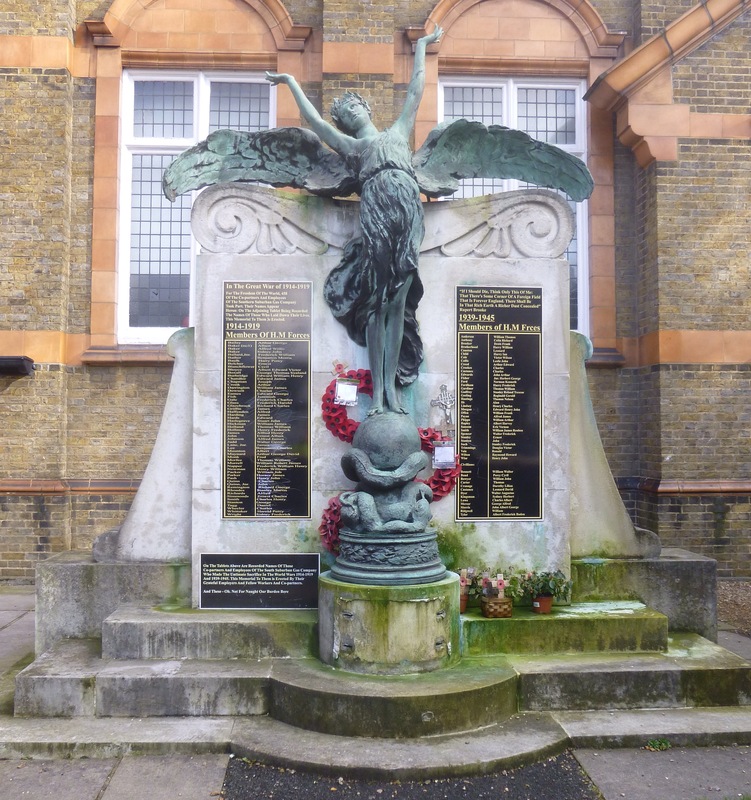 This entry was posted in Lewisham History, Listed Lewisham, War Memorials and tagged Bell Green, Listed buildings, Livesey Memorial Hall on February 13, 2014 by Paul B.